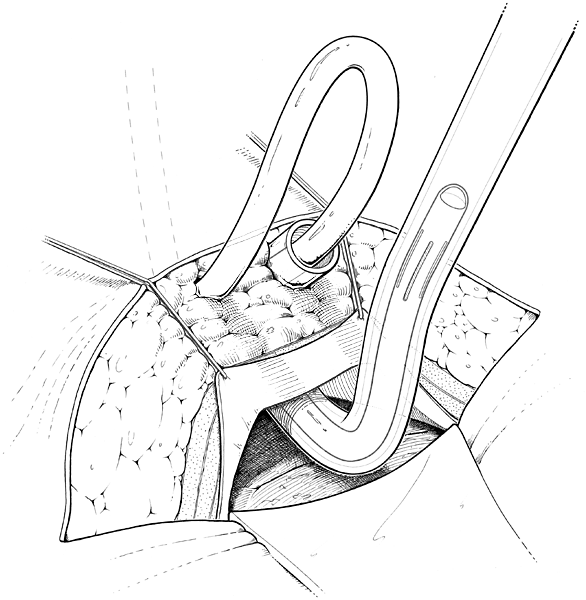 This illustration demonstrates step two in a method used to pass the peritoneal catheter of a VP shunt through the abdominal wall and into the peritoneal cavity through a pathway separate from the fascial and peritoneal opening. This image shows how the passer stylet is removed and the catheter is pushed through the empty passer to end inside the peritoneum. In the next step, the passer is pulled back, leaving the catheter tip inside the peritoneal cavity (not visualized here).